Today I guess should go in the long-distance hikers hall of shame. I think I probably only walked about 7km. The trail up above Wassen is still washed out from spring floods and also blocked by some construction projects, so I first walked 5km to the next town to catch the cograil train to Andermat. From there the hike to to top of Gotthard pass was clear. On arriving in Andermat, I checked my room reservation, only to discover that the cheap bunk I had found was not at the top, but instead was in Hospenthal, a pretty town but only about 3km more. My walking day finished at noon, and tomorrow will be more difficult than planned, but I’m in no rush to finish. I enjoyed the first clear sunny day wandering about the town. Hospenthal is set on a steep slope with cobbled streets and old timber and/or stone buildings with a church and old castle tower occupying the same knoll which looms up over the rest of the town. It is, like the other towns I have passed, at the intersection of several of the many transportation routes through the Gotthard area which includes some high trains to the Matterhorn, glaciers, and other sights, but also the several highways and train lines that populate the pass, each continuing to function even as they are displaced by new and faster forms. Just three days ago, the new Gotthard tunnel opened. At 35 km it is the longest tunnel ever built, and will, I imagine, slow the pace of life in the high villages I am passing through as it runs many meters down from these heights, carrying people from Zurich to Milano in record times. 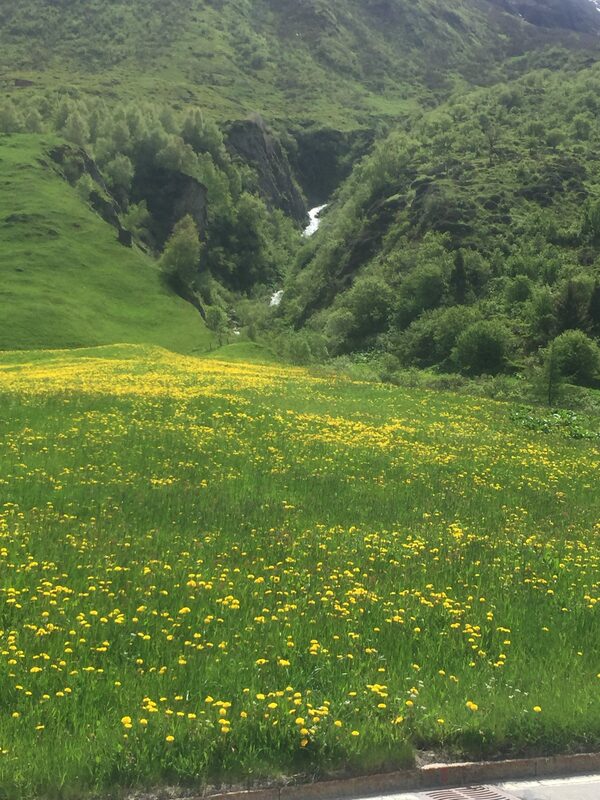 The trail today and yesterday was along a seriously rushing river and through fields blooming with wildflowers. I sat on a bench to eat some salami and cheese washed down by red wine and watched the river flow, thinking about how many times in the last year I have done the same– just sitting on a rock next to a stream, or crossing a field in full bloom. Then I thought how rare an occurrence that is in the regular work world for most people. To see such things requires planning and transport, not something that is part of daily movement. I am filled with gratitude to have had the chance to see so much but also puzzled as to why we have made it so difficult for such simple, quiet, moments to occur. The human turn to indoor labor, away from the weather, is a sad and troubling event.